I have been wanting to make homemade poptarts for so long now. This did NOT disappoint, let me tell you. Poptarts are really having a moment I think. They even have ~artisinal~ poptarts at the Starbucks checkouts now. My favorite flavor of poptarts growing up was cherry, followed closely by wild berry (dat purple frosting doe!!) and cinnamon. This may have been where my absolute (bordering on crazy) love of breakfast food began. Sometimes I can’t go to bed because I’m so excited about my breakfast plans. 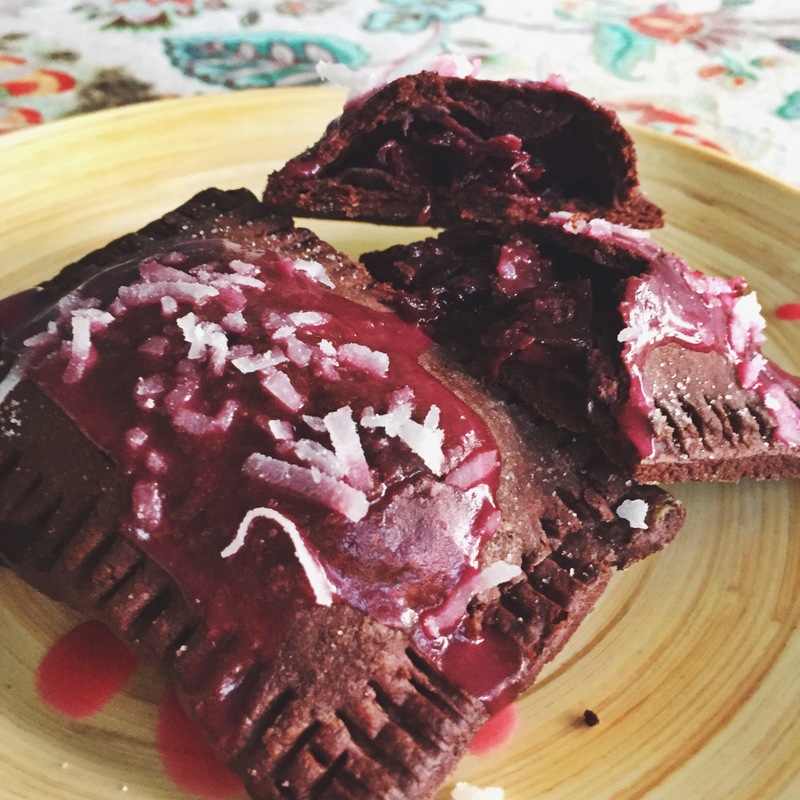 Seriously, these adorable and delicious poptarts are easier than you think and way healthier than your childhood version. They’re so versatile – lots of possible flavor combinations here. Oooh just thought of a pumpkin spice tart?! Shooot that would be good. Maybe next.. Prepare the filling by placing berries, agave and coconut in a small saucepan over medium heat. Cook for 5-8 minutes with a lid on, stirring occasionally and smashing down with a spoon. Let cool. To prepare crust, add flour, cocoa powder and sugar to a large bowl, then cut in butter with a fork until well combined. Using a tablespoon, drizzle cold water over the mixture and mix with a wooden spoon until it starts to form a dough. I added about 3 Tbsp – keep adding until the texture is moist enough to form a ball, but not too sticky. Turn out onto a floured surface, shape into a disc, and refrigerate for 30 mn. Roll out dough on a floured surface into a large rectangle. You can use cocoa powder to maintain the dark brown color. Cut into about 12 rectangles, and carefully transfer each to the baking sheet. Place about 1 Tbsp of filling onto 6 of the rectangles, leaving a 1/4 inch border to seal the edges. Use your finger to dot water around the edges of the base, then top the rectangles with a matching rectangle and then seal lightly with a fork. Poke a few holes in the top of each, and bake for 20 – 25 minutes. While these are baking, make the glaze by whisking together the melted Earth Balance and powdered sugar, along with food coloring if desired. Let cool for a few minutes, then top with glaze! These look so good I want to make some out of clay!